The UNESCO resolution also renames what Jews call the Kotel, i.e., the Western Wall (of the Temple Mount) and the area in front of it, as Al-Buraq Plaza, while using scare quotes when mentioning the common English term “Western Wall Plaza.” Well, what are a few millennia of documented Jewish history compared with a Muslim legend about al-Buraq, “a tall, white beast, bigger than the donkey but smaller than the mule” with “long ears” and “two wings on his thighs”? Muslims believe that one night, this creature took their prophet Muhammad “to the farthest Mosque” – which of course couldn’t possibly have been located in Jerusalem during Muhammad’s lifetime (supposedly 570 – 632 CE). In reality, the Muslim claim to Jerusalem was simply established by force when Muslim troops conquered the city 636-637. The countless Christian paintings of this scene and others depicting Jesus in the Temple should now also be properly relabeled; particularly countries like Italy, Spain, France and Sweden, which are surely in possession of many such paintings but couldn’t muster the backbone to reject the UNESCO resolution, should urgently devote themselves to the task of ensuring that their museums, churches and monasteries do not violate the UNESCO charade they acquiesced in so cravenly. The Palestinians can now rightly feel that UNESCO has given this kind of incitement its stamp of approval. It is also worthwhile recalling in this context that the fantasy that the Al-Aqsa mosque is threatened by Jews is an invention that goes back to Haj Amin al Husseini, the Mufti of Jerusalem, who later gained notoriety as a Nazi collaborator. After al Husseini renovated the Haram al-Sharif in the 1920s, he began to accuse “the Zionists” of plotting to rebuild the Jewish Temple. His incitement contributed to repeated outbreaks of violence against Jews, culminating in the Hebron massacre of 1929. And not that long ago, we had the bloody “Al-Aqsa Intifada” – perhaps UNESCO feels it’s time for another one? Jesus was clearly guilty of Islamophobia in upsetting the tables of those Muslim money-changers. 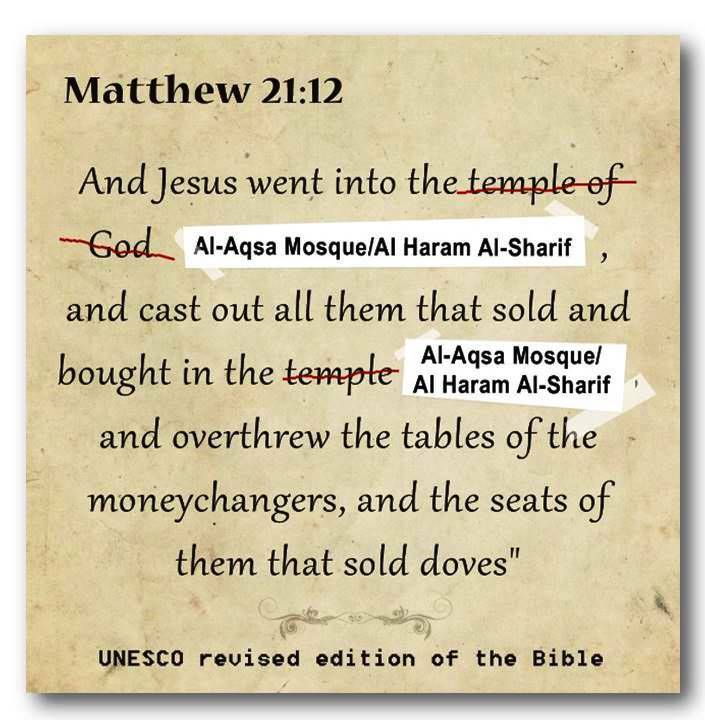 Does this mean after 2,000 years of accusations that it couldn’t be the Jews responsible for the crucifixion of Jesus, by UNESCO’s logic it had to be the Muslims. Well the Islamofascists do have cruxifixion as a penalty and no Jews ever did. Excellent analysis of vote by country. Eventually western cultures were forced to abandon the view of a geocentric universe, because its complications in contradiction to the far simpler facts became embarrassing. Here we have UNESCO repeating the same entropic exercise on behalf of the racist fantasies of Arabs railing against Jews, the sciences and secular and religious history. This is more than sad, it’s tragic and even criminal. It is of a piece with totalitarianism. UNESCO has been a corrupt, racist joke almost from its inception.